David was having a bad day. While he and his men were away, his town had been destroyed. All of the women and children—including David’s wives—were captured and carried away. His own men blamed him and wanted to stone him. Ever feel like that? Like everything you care about has slipped through your fingers? Like you’ve tried—over and over again—to do the right thing (believe the right thing, pray the right thing…) but things keep getting worse instead of better? Like you really need the love and support of others but everyone you know is under the weight of their own losses? In those times—in times of deep discouragement and even despair—how do we find encouragement and strength? Looking for affirmation on social media or other pseudo communities is an illusion that never helps for long. Checking out through bad habits and vices may dull the pain but ultimately leaves you emptier. Fear, anger, resentment, self-pity, and a zillion other negative emotions may feel justified and might even provide a false sense of vindication—for a moment—but left unchecked they only lead to bitterness. And bitterness is always a poison and never an antidote. “But David strengthened himself in the Lord his God” (1 Samuel 30:6 NKJV). You would think that in such a dark time the Lord would have made finding encouragement just a bit easier. You would think He would have brought a slew of great encouragers (rather than discouragers) to David. You would think that maybe God Himself would have made an appearance or sent a miraculous sign. You would think that somehow, someway, God would have made getting through the whole ordeal just a bit warmer and fuzzier. You would think. But that isn’t how it happened. It wasn’t warm. It wasn’t fuzzy. And it probably didn’t look particularly pretty. In fact, it was undoubtably messy and exceptionally painful. But David did the only thing he knew to do. Ultimately, it was grit, not glitz, that positioned David, once again, before the One who had consistently proven His grace to be sufficient. But all the while God was still working in David. There are many reasons for the timing of God. Those reasons may or may not have a thing to do with us and our personal choices. But through it all—if we continue to let Him—God is always working in us. I think that’s why David was a man after God’s own heart. He was teachable. He was far from perfect—there were some wins and some losses in David’s character development along the way—but he kept returning to the heart of God. Even in the midst of his greatest mistakes and losses … even when nothing made sense…even when he was weak and weary and without strength of his own…he knew where to run. That’s why this day was such a big win. Maybe the biggest win of David’s whole life. 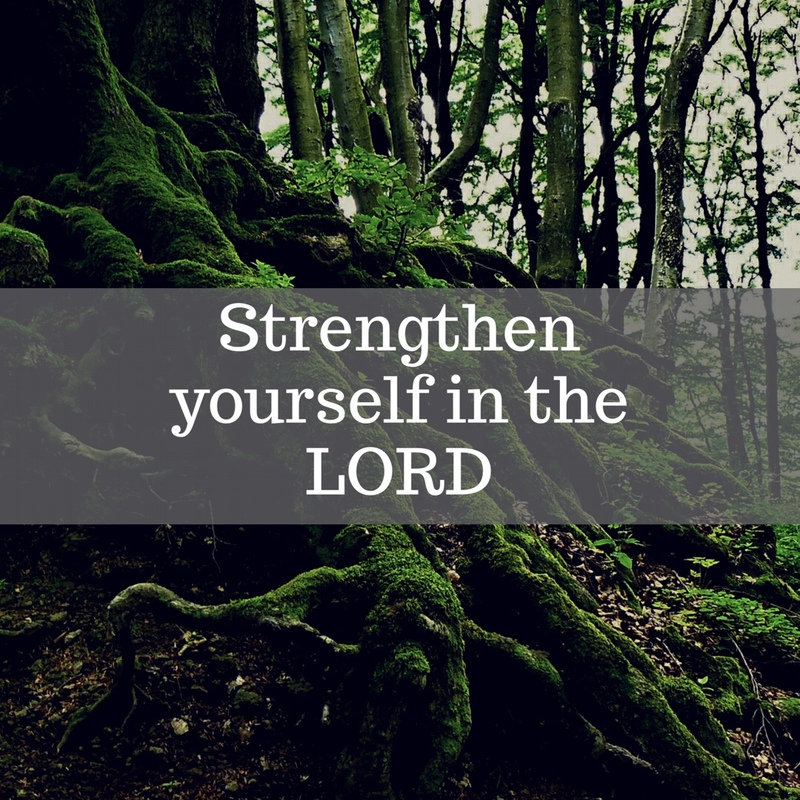 David strengthened himself in the Lord. It is a choice. An eternal choice. An eternal choice of immeasurable consequence. It is the choice to believe, and keep on believing. Sometimes the choice is clear and easy but other times it’s not. It is possible to keep believing in God without really believing Him. Our God is who He says He is and He will do what He says He will do. So don’t wait a minute longer…strengthen yourself in the Lord today. Thank you dear Cindy for sharing these wonderful truths! How often I’ve turned to this passage when I needed to “encourage myself in the Lord”. Our journey of faith often reflects the faith of David, encouraging us to look to Jesus who never leaves nor forsakes.Thanksgiving Blessings to you! Amen – so grateful for His steadfast love ❤️ Thanksgiving blessings to you, too, Glenda! That’s always been one of my favorite passages showing David’s faith in God. It’s encouraged me many times. 🙂 I think God allows these kinds of crap days so we won’t be so circumstantially-driven. After all, we only need faith when there is no evidence of God. If things always go our way all the time we would be so full of ourselves and our faith would be superficial. As David said in Psalm 61, when my heart is overwhelmed, lead me to the rock that is higher than I. And he certainly walked the talk. Great insights, Cindy. Blessings to you. Many blessings to you, Mel. Have a great Thanksgiving! I’m glad I read this today! I was just in this passage last week. The thing that struck me was that David’s men turned on him and played the blame card. They almost stoned him. Instead of crumbling, David turned to God. He grabbed for the ephod and asked for God’s guidance. Today we have the Holy Spirit inside of us so we don’t have to go to the priest and ask for the ephod. When things are amuck, that’s where we are to go and ask: “God, what is going on? You have to tell me. Should I stay or should I go? I need Your voice to lead me and to strengthen me.” I will make that bold declaration before Heaven and Hell–God is the strength of my life!